A second Colorado ski area opens today as Loveland finally joins Arapahoe Basin despite the ongoing dry, warm weather and lack of natural snow in Colorado’s high country. Loveland Ski Area opens for the 2016-17 season on Thursday, Nov. 10, joining A-Basin. Breckenridge and Keystone both indefinitely pushed back their opening days, while Copper Mountain postponed but now has set its opening for Friday, Nov. 18, when Vail is also scheduled to kick off its season. 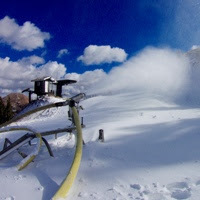 Snowmaking at Loveland, which opens for the season today. Loveland Ski Area opened on Oct. 29 last season. Lift 1 at Loveland will run from 9 a.m. until 4 p.m. today and will offer snow riders access to one top-to-bottom run covered from tree-to-tree with an 18 inch base. The trails Catwalk, Mambo and Home Run make up this opening day, run which is over a mile in length and nearly 1,000 vertical feet. Loveland Ski Area will be open seven days a week until closing day in early May. Lift operating hours are 9 a.m. to 4 p.m. on weekdays and 8:30 a.m. to 4 p.m. on weekends and designated holidays. Early season lift tickets are $59 for adults and $27 for children 6-14. Arapahoe Basin hopes to open another run by the weekend after crews made a significant amount of snow on Ramrod the last few nights. While daytime temperatures in the mountains have been in the 50s and low 60s, nighttime temps have dipped into the 20s and the atmosphere has stayed dry, which is good for snowmaking.